A well-made guitar and belies its meagre price tag. Looks may put some off. 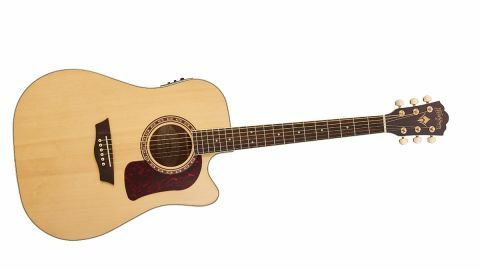 The HD30SCE takes the classic dreadnought chassis of the lower-priced HD10S and modifies it with a cutaway at the 14th fret to better facilitate your dusty end visitation rights. Also included in the price is a Fishman Presys+ 501T pickup and preamp system with a built-in tuner. Like its more affordable brother, the HD30SCE offers a solid top of Sitka spruce, a satin-finished mahogany neck, a rosewood fretboard, 20 vintage frets and body and neck binding made of white plastic. You also get a bit more flash for your cash for your 400 notes. The gold finish to the die-cast tuners obviously looks more plush than the plain Jane chrome jobs, but turn the guitar over and you'll find highly figured quilt ash back and sides. It's a bold look, almost psychedelic if you look at it too closely, and not everyone will go a bundle on it - but it definitely helps this guitar stand out in a ridiculously crowded budget acoustic market. Straight from the box, the HD30SCE pumps out a bright tone. It's a bit lighter in the bottom end than the HD10S. Ash is an unusual choice of acoustic tone wood, it's best known as the nucleus of a great Telecaster, but we like the combination of ash and spruce here. Yes, it's bright and loud... but it's not brash. Although you can't predict these things with absolute certainty, we would expect the tone to mellow a bit as the guitar is played in. Of course, you have a lot more control when the guitar is amplified. Boosting the bass on the Fishman preamp adds a bit of girth to the overall tone.